“In the Bag’s” very own leader, Brenda Blisk, has been named one of three finalists nationwide in the Community Service Award category in the twelfth annual Invest in Others Awards. For her efforts, Brenda has already received a $5,000 grant for the American Red Cross National Capital Region. If she is selected as the category winner this amount increases to $20,000 impact dollars. We are thrilled that “In the Bag’s” very own leader, Brenda Blisk, has been named one of three finalists nationwide in the Community Service Award category in the twelfth annual Invest in Others Awards. She will attend the Gala on September 27th, 2018 at the Westin Boston Waterfront, in Boston, MA, where the final winner will be announced. For her efforts, Brenda has already received a $5,000 grant for the American Red Cross National Capital Region. If she is selected as the category winner this amount increases to $20,000 impact dollars. The Invest in Others Charitable Foundation established its awards program to recognize the impact of the charitable work of financial advisors and financial services firms in communities across the country and around the world. Each year, the advisors help millions of people across the country and around the world. The corporate finalists, which range from small advisory firms to large financial institutions, offer a variety of successful programs that creatively incentivize and encourage employees to give back, including generous matching gift programs and volunteer time off. Brenda Blisk is the Founder of Blisk Financial Group. In 2010, she aspired to create a philanthropic program where her employees, Spire Investment Partners, and clients could participate and give back. 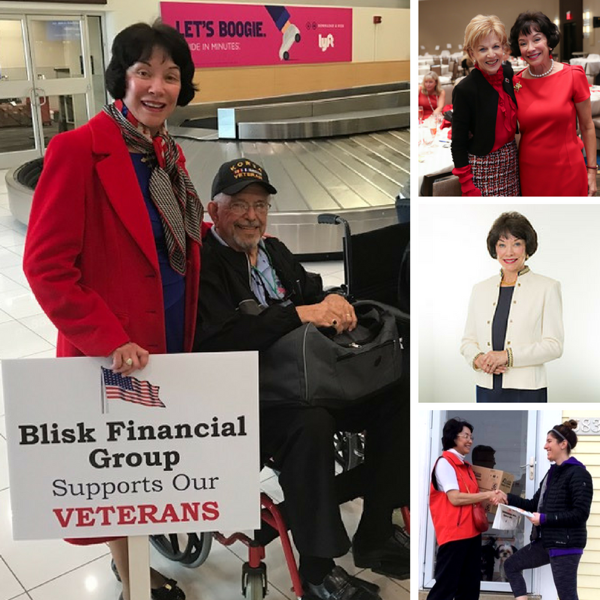 The goal was to reinforce who Blisk Financial Group is as a company and project its company values while serving the community. The cause that was selected, The American Red Cross, is one that is near and dear to Brenda’s heart, and “In the Bag,” a designer handbag auction was born. Brenda has provided visionary leadership for all aspects of In The Bag, from recruiting countless event volunteers to being a leader in the Tiffany Circle, a giving circle for prominent, high-level donors for the American Red Cross. All together, the combined efforts with her team of volunteers have resulted in raising over $1,245,000 in eight years. Brenda’s efforts to create a sustainable fundraiser that appeals to working women has so been successful that other Tiffany Circle chapters have adopted similar fundraising models for the Red Cross. “In The Bag” will be held on Friday, November 16th at the McLean Hilton from 11-2. Tickets are on sale at https://inthebagrc.com/. We hope you will join us for a very special day of celebration, networking, and charitable giving. For more information about Invest in Others, please visit www.investinothers.org.